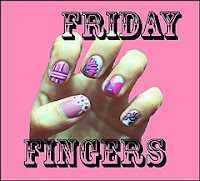 This week's Friday Fingers has been challenging not so much because of the floral theme, but because of the crunch-time mode I was in. My days have been so hectic from Monday to Wednesday that I barely had time for myself. I thought I could squeeze in a nail-painting session after meeting Yoda yesterday but Alva fell sick when we got home. After a trip to the doctor, we found out that Alva had caught an infection. She was given paracetamol and some antibiotics but was cranky the whole day. While she was taking a nap, I thought I'd take a little break and start my FF effort. But nah, she woke up only minutes after I started. She was so restless the whole night, I had to cuddle her to keep her settled. Today, Vava is feeling a lot better. It seems the infection has cleared off. Last night was a nightmare. I was worried sick because she was breathing raggedly. It freaked me out seeing her like that but the nurses whom I called said it was because of her fever. I'm so glad she's recovered now. Okay. Back to my FF story. So. I continued my effort this morning while the kids were playing in the living room. This time, I decided to have a blue base with lots of white flowers to match the background. I was just about to create a white petal when Alva lunged at me out of nowhere. She was running from Alden who had turned into a nasty monster. Like the one in Scooby Doo. Things started to get messy when they saw what I was doing. Alva kept saying, "Wow mummy, so pretty. How about me?". I couldn't concentrate cos Alden was also driving me nuts with his questions. Alden: Why you painting your nails mum? Me: To make it look pretty. Alden: Why you like it mum? Me: I just like it okay. Alden: I love green. Green is my favourite colour. I love blue too. Blue is my favourite colour. He then takes a red nail polish. Alden: Oh! I love red! Red is my favourite colour too. Alden: Oh!! Blaaack! I like BLACK. Black is my favourite colour mum! He takes a white nail polish and says....well, you know the drill. I have altogether 12 nail polishes. What Alden does, Alva follows. Alva takes a yellow nail polish. Alva: I like orange. Orange is my favourite colour. You like orange mummy? Me: That's not orange. It's yellow. Alva: You like yellow mummy? This very exciting conversation was repeated for, I dont know, 10 times? I had to stop the mental torture so I cleared my stuff and decided to take everyone out for lunch. My treat. After lunch, hubby and the kids sent me to the office so I could work on my thesis. I was so eager to get there cos I had snuck a bunch of nail polishes and dotting tools in my bag without their knowledge. Hehe. My plan was to spend an hour doing nail art before I start writing my thesis. It was a great plan! When I got to the office, all lovely thoughts about my beautiful flowered nails came to a screeching halt. Two of my colleagues were in. Crap! I can't possibly paint my nails with them around. I forced myself to work on my thesis and not think about nails. After 4 hours, my colleagues finally called it a day. By that time, my excitement had totally dwindled. Plus. Hubby was going to pick me up in a bit so there wasn't time to even clean my nails. When I finally got home, it was dinner time. After dinner I just sort of laze around with hubby and the kids. I tried putting them to bed early but they were so full of energy. They only got to bed around 10.30. Not good, I know. After the kids were asleep, I thought I'd just hit the sack, yet for some reason, I wasn't tired. I reckon it's because of the coffee I had at 7.00. I'm not a coffee drinker so I get all hyper whenever i have a cup. Mentally, that is. Yeah, I finally got around to doing my Friday Fingers. I'm not so crazy about the colours but am too lazy to redo everything. Haha...that's exactly how my girls disturbing me when I'm doing with my nails. To avoid them to keep on asking me questions, I let them use my nail polish. But still inda siok kalau ada kacau2. I really2 like ur nail art esp ur base colour. I should've used different colour for mine. Maybe next FF lah. I don't really lie the base but haven't got the time to shop for new colours :) Next week lah. Nicely done dots Liz! And the color combo pun ngam ni. Aemy-You got that right. One time is cute but after the 5th time, it gets really annoying hehe. Kay-Thanks! I'm not that pleased with this week's FF cos it looks a bit dull hehe. 1 more week and I'm so gonna start doing nail arts. And I'm going to copy your flowers ya...hehe...boleh kah? Step 1: shopping! Debra-Kau lagi la susa debs. Mita and Chanel dua dua suka minlawa :) For me, si Alva ja hehe.